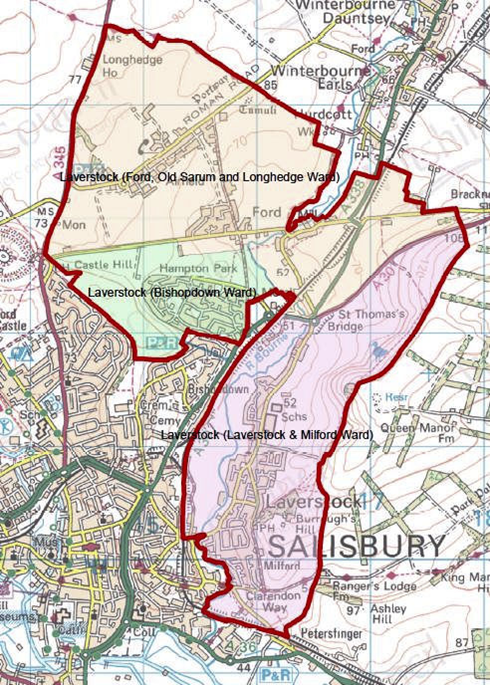 Laverstock & Ford Parish (incorporating Bishopdown Farm, Hampton Park, Riverdown Park, Ford, Old Sarum, Longhedge and parts of Milford) is a progressive community of four very different localities adjoining the City of Salisbury, Wiltshire. The modern civil parish boundary has been superimposed. It was a very ancient historic association which first linked the localities in to one administrative Parish but what keeps us together is a sense of community. Our residents in the three thousand seven hundred plus households prefer to be managed by the collective administration of the Parish Council rather than simply being part of an urban extension of the city. Our Parish Plan is a good place to start if you want to know more about the Parish, its history and its aspirations for the future. The Parish Council takes its responsibility of being the smallest unit of local government very seriously. It consults widely on important issues and believes very strongly that as well as being good at listening it must keep the residents well informed about what is happening around and about. Part of that process is our Parish Newsletter which is a bi-monthly publication. It reaches well over 3,800 households and businesses. The website is also part of our determination to keep residents informed and to be receptive to the comments coming to us. If you are a resident and wish to make a comment please click on the 'contact us' box and email your views to the Parish Clerk. Parish Council meetings are normally held on the third Monday of every month. We hold our meetings at three locations in the parish, see our meetings page for details. Anyone can attend and the first part of every meeting is open for public discussion. Please feel free to come along and be assured - WE ARE LISTENING. Why is it called Laverstock & Ford Parish? Who remembers the ‘Laverstock Panda’?